I look back at some of my old posts and realized that many of the restaurants I featured have closed down. They are Scarlet, Mr. Ho’s Fine Foods and a few others. Meanwhile, the rest are cutting down on their quality and quantity. It is a pity really. I cannot blame them for cutting down quality and quantity because many of the imported food stuffs are getting so expensive. Butter, cream, cheese, cured meats and other imported food stuffs have probably increase at least 20% in their price. In fact, you cannot even find butter in Tesco. They only sell fake butter spread which is margarine. In Penang, you cannot price your meals too high as many patrons are not ready to pay more than RM30 per dish. If your plate of pasta is over RM15, it is already considered rather pricey. We went to Edelweiss (non-halal, Swiss restaurant) today and sadly, there are hardly any patrons eventhough their set lunch is reasonably priced and their food considered good. I love the old, heritage building of Edelweiss and hope the new Penang State Government will promote these heritage buildings are they are really one of its kind in the world. Beside my table, there are only three other tables and they are occupied by foreign tourists. The set lunch is RM19.90 which include either a soup or salad, a drink, dessert and one main meal. I had the fried spaghetti which is their house speciality and I don’t have any other choices as the rest are all meats. They call it Urs favourite or something. Urs Capol is my ex-colleague who is a jewellery designer from OE-Design. 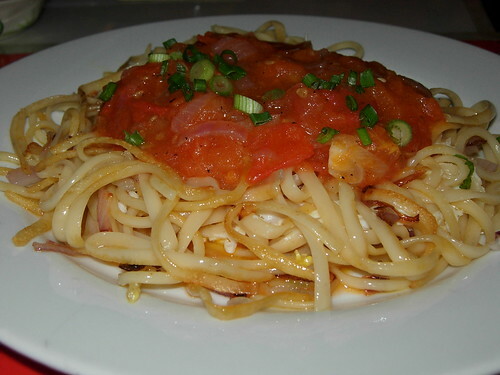 This humble looking dish consist of a fried egg, some tomatoes and onions. Surprisingly, Teresa Capol (Urs’s wife) dished a really nice pasta. It is not exactly Italian masterpiece but more of a comfort food. More on Edelweiss on my personal blog at 5xmom and also another post on this blog on cheese fondue. 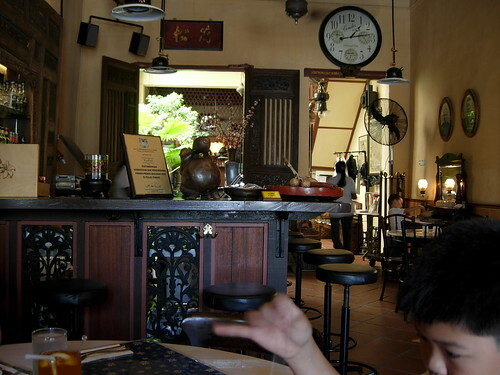 Let’s hope cosy restaurants like these continue to thrive in Penang because they are really homely and unique. Rental are the main cost factor for restaurant in Malaysia. Since Penang lack the volume vs KL, but the rental are almost on par with KL. So the good restaurant owner must find a solution for their rental problem. And rental has something to do with local government properties assessment fees and taxation. it IS very competitive to run a food business in penang. i love the food at Edelweiss too. but my brother will say its expensive. i am the type who dont mind paying a bit more for good food. sadly most penangites want ‘cheap and good’ stuff. that’s why all the fine dining places here can’t survive, or they make compromises on their ingredients which affect the food quality. yeah renting these old buildings costs a bomb…in Italy there are a lot of such home style restaurants…hm i dun think they are even called restaurants cuz they could only ocupy a certain amount of ppl. But heck they still offer resonably priced good food…HK is going the same trend (Si Fang Chai). Why Malaysia cant? It’s much cheaper to run the place, food quality could be maintained and authenticity factor will be there. Jian- Ya, when I was in Italy, I went to those small restaurants a lot. It is so fun. I wish they will promote these heritage buildings and I also want to buy one and open my own little place! Nice hor? Like Greenhouse like that. lingzie – The place is soooo nice. My family loves Edelweiss not just because we knew the owners but the food served is wonderful and authentic. We knew how the owners built up the worn out building because we were there visiting the place with all the dust ad rubbles and the steps they took to ensure that the property was returned back to her original state accordingly to the Heritage Law… Not to mention delays by certain government departments… oofffs! Oh… bravo for almost completing your vegetarian feat!! Keep it up!